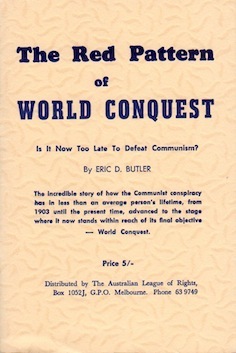 The incredible story of how the Communist conspiracy has in less than an average person’s lifetime, from 1903 until the present time, advanced to the stage where it now stands within reach of its final objective - World Conquest. The general failure to understand the true nature of Communism stems, to a very great extent, from the loss of understanding and belief in those fundamental, spiritual and moral values upon which Western Civilization was created. Communism is not primarily a question of economics or politics. It concerns the nature and purpose of man, and the non-Communist world has no chance whatever of surviving the challenge of policies stemming from a philosophy of dialectical materialism by attempting to oppose Communism with policies which are also rooted in materialism. A firm stand against Communism, based upon fundamental moral principles, would not only rally the peoples of the shrinking non-Communist world; it would restore faith and hope amongst millions of fellow human beings living under Communist yoke.